Investing in Infrastructure Resilience Webinar Series Learn about activities, technology and funding opportunities that will help drinking water and wastewater utilities increase investment in building resilience. This webinar will provide an overview of the response to a distribution system contamination incident and the steps utilities can take to prepare their own response procedure. It will cover roles and responsibilities when working with response partners. The webinar will also discuss possible response actions that can be implemented to minimize consequences, such as operational changes to reduce the spread of contaminated water and public notification to minimize customers’ exposure to contaminated water. Please circulate the attached webinar flyer to help us advertise this learning opportunity. This webinar will provide an overview of capabilities necessary for field and laboratory response to a possible drinking water contamination incident. It will include a discussion of priority contaminants, analytical methods, emergency response sampling kits, and field testing equipment. Lessons learned from utility implementation of emergency response sampling and analysis capabilities will also be presented. Please circulate the attached webinar flyer to help us advertise this learning opportunity. 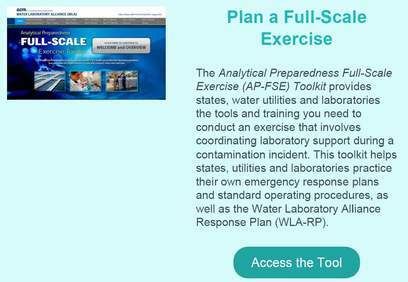 Tabletop Exercise Tool for Drinking Water and Wastewater Utilities EPA has just updated the Tabletop Exercise (TTX) Tool for drinking water and wastewater utilities. The TTX tool provides users with the resources to plan, conduct and evaluate tabletop exercises. 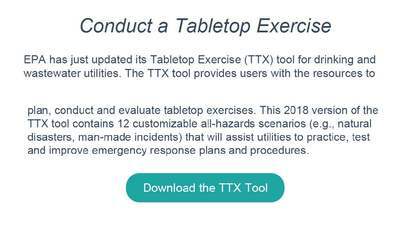 The 2018 version of the TTX tool contains 12 customizable all-hazards scenarios (e.g., natural disasters, man-made incidents) that will assist utilities to practice, test and help improve emergency response plans and procedures. EPA's Water Security Division is hosting a webinar series during Critical Infrastructure Security and Resilience Month to highlight activities, technology and funding opportunities that will help drinking water and wastewater utilities increase investment in building resilience. To Register click the "Select A Date" box on this webpage to enroll in one or all of the presentations. This webinar will focus on activities that drinking water and wastewater utilities can implement to increase community and decision maker support for infrastructure investments. Utility case studies will demonstrate the success of these activities. This webinar will identify resilience technologies and projects that can be incorporated at any size utility to prepare utilities to quickly respond, recover and reduce impacts in the event of emergencies. Utility case studies will demonstrate how these projects has made them more resilient. This webinar will feature funding sources that can be used by drinking water and wastewater utilities to invest in resilience projects. Utility case studies will demonstrate. Click each image below to access EPA's information on each topic.